We have not yet been able to obtain a photograph of Harry Bennett, however we found his grave in North Merchiston Cemetery and attach a photo of this. 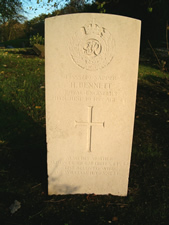 The inscription reads: “14555219 Sapper H Bennett, Royal Engineers Age 23 11th June 1946 also his mother Alison Denholm, died 5th January 1947, the beloved wife of William H Bennett“. They lived at 5 Hermand Crescent and Harry was their only child. His name was on the memorial of North Merchiston Church.